Longview Park is the perfect place at Marist to take a scenic stroll when you are not drowning in schoolwork. The riverfront is home to two boat houses, a gazebo, rolling hills and a handful of docks and is open to the student body as well as to the public year round. The park has not always been this pretty nor this accessible and has a storied history that starts in the era of railroads and steel plants. In the mid-19th century, the City of Poughkeepsie purchased part of the land from the Bech estate- later to become a part of Marist’s campus- for a new waterworks operation. The waterworks allowed Poughkeepsie, whose population was seen as sickly, new access to a fresh water source. In the early 1900s, the Marist Brothers sold parts of their riverfront land to the Dutton Lumber Yard, which operated just south of their land. The two transactions left the brothers with just 180 feet of land, according to an essay by former college President, Richard Foy. In 1895, the Intercollegiate Rowing Association was formed between three of the top rowing schools in the country. 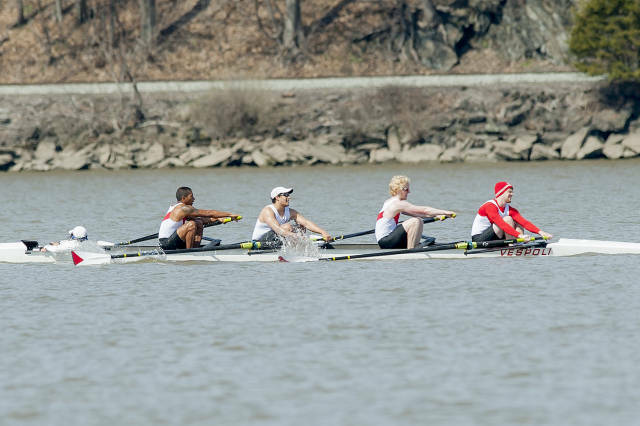 Cornell University, Columbia University and the University of Pennsylvania came together to form the IRA and chose to hold their championship races in Poughkeepsie. These races, held once a year from 1895-1949, with some years omitted, pitted crew teams from across the country against each other in a four mile race up the Hudson River. Teams would arrive anywhere from a month to a week early to begin training, said Elizabeth Clarke, Assistant Librarian for Research Services at Marist, who has been focusing on the park and its history. Up until the 1930s, the teams would house in town and launch from plank board shacks with docks along the river that would “barely last a winter,” said Clarke. The Regatta brought such an economic and cultural boom to the city that they decided they had to work to keep the IRA coming back. The City of Poughkeepsie decided to use some of the land they had bought for the waterworks project that had been sitting empty to build, in conjunction with the schools in question, three boathouses. The first boathouse, intended for the crew team from MIT was built in the winter of 1929 and ready for the regatta in 1931. MIT did not show up to the Regatta for some time, so they handed their house off to the University of Washington. The second boathouse was constructed in much the same way, over the winter of 1931 and ready for the Regatta in 1932. It was built for University of California at Berkley. Both boathouses consisted of a living space upstairs and shell and equipment storage downstairs. The last boathouse constructed was the Cornell boathouse, which still stands today in Longview Park. This boathouse was not finished being constructed until 1938. Clarke said she is still researching why this boathouse in particular took so long to finish. It was the first boathouse to be funded by the WPA, and the last one built in what was now known as Regatta Row. Teams would arrive early to practice on the Hudson, whose shifting tides and winds were often unfamiliar to the competing teams. According to Clarke, they would live in the upper floor of their boathouse, eat in the mess hall built next to the Washington boathouse and store their equipment downstairs in the boathouses when not in use. 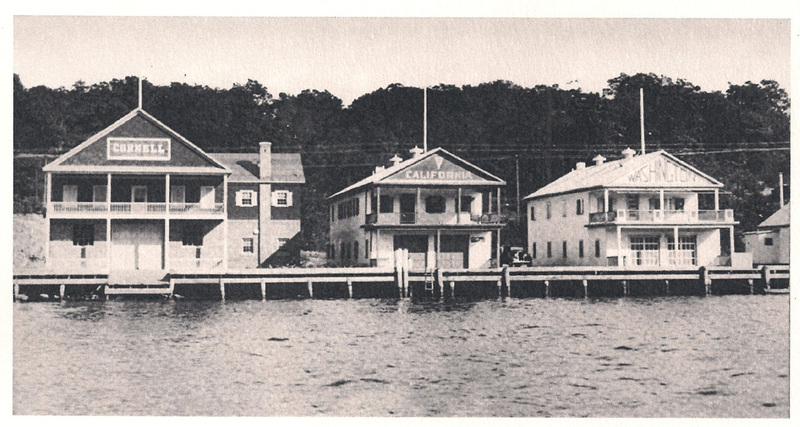 Poughkeepsie housed the original Regatta Row until 1949, the last year the Regatta was held in Poughkeepsie. It moved to Marietta, Ohio the following year, and has yet to return to its former glory nor its Hudson River hometown. The City of Poughkeepsie owned the land that the boathouses were built on. They oversaw the maintenance of the boathouses and their security after the Regatta left town. Local schools used the boathouse facilities. According to Clarke, sometime in the 1960s, both the dining hall and Washington boathouse burned down, causing damage to the California boathouse. Eventually, California needed to be torn down due to disrepair. In 1963, three years after the establishment of the Marist rowing program, city meeting minutes show the beginning of Marist’s very own boathouse. Named after one of Marist’s early supporters and investors, Martin boathouse was built in time for the 1964 American Schoolboy Rowing Championships. Boulders from a street blasting in Poughkeepsie were used to create a bulkhead where the new dock would go. Boathouses in 1963 (courtesy Richard Foy). The economy in the 70’s tanked, and with it went the ability of the City of Poughkeepsie to maintain the boathouses. They fell into disrepair and in 1977, Marist acquired the Cornell boathouse under the condition that it be available for local schools to use until 2002. Records from 1998 show the beginnings of the creation of what we now know as Longview Park began as a proposal to the City in 1997. Articles in the Poughkeepsie Journal from 1999-2004 mention hope that the park will be completed either later the year of the article’s publishing or the following year in each article. In reality, the park that started in 1998 was completed in its first stages in 2007. Prior to this, “the property features a few park benches and two boathouses, but is basically undeveloped,” said the Poughkeepsie Journal in 2001. Four acres of the new park are owned by Marist, and two are owned by the Town and the City of Poughkeepsie. The $2.1 million dollar park was funded by Marist and various federal, state and county grants, with the intention of creating a green-belt of walking trails from Quiet Cove, just to the north of Longview Park, along the waterfront. According to Stathers, when she arrived at Marist in 2007, Longview Park was “flat and gravelly,” nothing like the rolling green hills occupying the park now. Martin Boathouse (photo courtesy Marist Athletics). The waterfront is publicly accessible and has a number of amenities and scenic views. The park is also part of an ongoing effort to re-orient the campus toward the river that makes the campus “so special and unique,” according to Greg Cannon, Chief Public Affairs Officer at Marist. Cornell boathouse was also renovated in the project, starting in 2004 and ending in 2009. The upstairs now houses a public and private event space while the downstairs still functions as shell storage. It still retains some of its original features including a gas fireplace. “It is only fair to say that the park wouldn’t exist in its current form without rowing, said Sean Rizzotto, assistant men’s rowing coach at Marist. He said it is a huge psychological boost for the athletes to have such a venue at their disposal. Marist is one of very few campuses to have their boathouse on campus, let alone two boathouses. Students in most rowing programs have to drive 40 minutes every day to get to their boathouses. Marist’s Mens Crew Team in the 2014 President’s Cup (photo courtesy Marist Athletics). Longview Park (photo courtesy Marist Athletics). Special thanks to the Marist Archives, Eliabeth Clark, Sean Rizzotto, Michelle Stathers, Marist PR, and Greg Cannon for lending me more information on Longview Park than I ever thought I could handle!